Kim Reichhelm went from being one of the biggest skeptics of women's skis to one of the biggest proponents. Former member of the U.S. Ski Team, NCAA All American and two-time World Extreme Skiing Champion, Kim Reichhelm has played a huge part in taking women’s skis from “shrink’d and pinked” status to not only a technological level that’s beneficial, anatomically speaking, but also to new horizons for women who go as hard as the guys do. The ironic thing? She was one of the original and biggest skeptics of skis made just for women. Standing at 5'10" and 140 pounds, Reichhelm wasn’t buying that her lower center of gravity and hip Q-angle necessitated a different pair of planks. That is, until she had the chance to do a blind test. Nowadays, she heads up the K2 women’s ski test team and hosts women’s/coed skiing and steep camps around the world. 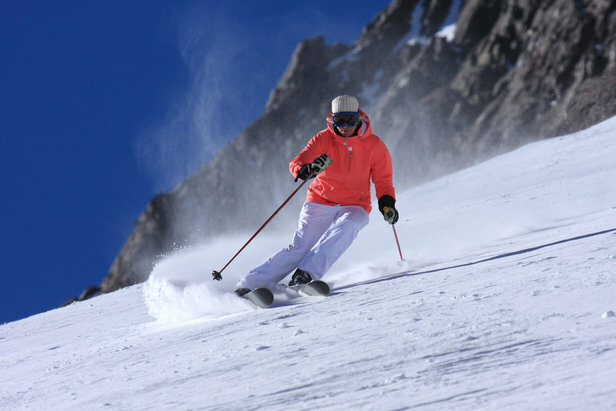 In honor of International Women’s Ski Day coming up 12.13.14, we caught up with Reichhelm to see what she’s up to. A: I was skiing at Mt. Hood in Oregon. It was 2000—the year we started the K2 Alliance. K2 put the team in charge of making the best ski we could make. We had all the resources we needed to make any ski we wanted. It took all summer, as we continued to come up with design changes, the engineers would go back to K2 in Seattle and make us more prototypes. It wasn’t until we were finished and happy with our design that I really knew our ski was better. I skied on the unisex ski of the exact shape and length and realized I could ski just as well on the women’s version without getting so tired. It was easer, more forgiving and I used less energy on the women’s ski. Up 'till that point I didn’t think I needed a women’s specific ski. I thought I was making this ski for other women. But once we were done and as we continued to develop more models specifically for women, I realized I was wrong. Women’s skis are better for women. When you ski on women's skis, you're less tired. When you're less tired, you have more fun. Q: What’s the most important distinction between men’s and women’s skis—the technology modification that matters most in your book? A: I think the biggest difference is the materials inside the ski. The difference between the men’s skis and the women’s ski is quite small, but the small difference in construction makes a big difference in the performance. Our skis are softer, more forgiving, and the narrowest point in the ski, the waist, is farther forward. Q: Tell us about the testing process. What’s a day in the life like? A: A testing day is a long day. Up at 5:30. Out the door at 6:00. At the base of Mt. hood at 6:30. Boot up, meet with the engineers and go over the groups, get test cards, screw drivers, extra clothing and water. Each of us take two or three pair of skis to the lift. Load the lift at 7:00. We split into two groups, and each group takes a category. For example if we are designing a new ski that is 90mm underfoot , there will be five skis in this category. The other testers will do another category, like a 105mm underfoot. We take one run on each ski in the category, making notes on our cards on the lift. Get to the top, adjust binding, switch skis and do it again. Once we have skied all five in the group we switch groups. Most days are 15 runs on 15 different pair of skis. All of the graphics are white, with just a letter and number on the top sheet. Like A1, A2, A3. We have no idea which ski is which. After the skiing part we all head down to the car, load up and go back to Government Camp to change. Since it seem like it’s always raining, we are cold and wet! After that we sit down and discuss the results. Only after all results are given and discussed do we find out which ski is which. Once we learn about the different construction we discuss which design features we like and how to move forward with the next set of prototypes. It’s a long process that costs a lot of money but, our design/test program is authentic. We, the Alliance team, make all the decisions about how the skis are made. From what I know, K2 is the only company depends 100 percent on women skiers to develop their skis. Q: Where would you like to see women’s skis progress into the future? I’m always asking my clients to try a longer ski and although they really resist, once they try, they always like the longer ski. Longer skis are just as easy too turn, are more stable and build confidence. 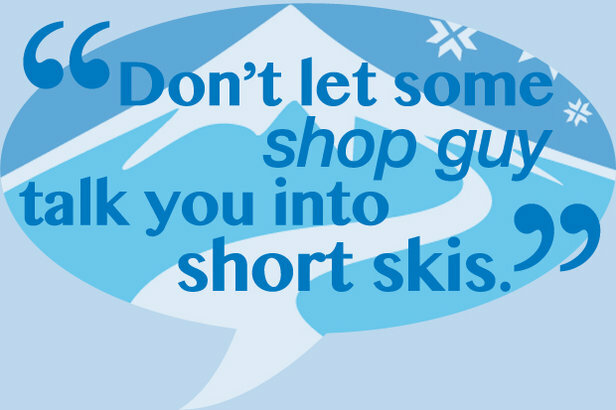 Women think that shorter will be easer, but if the ski is too short it’s not stable and makes it harder to ski fluidly. My rule for length is that unless you are beginner, the ski should at least come to your nose. And if you are an advanced skier it should come to your forehead. If you like to go fast and make bigger turns, go longer. If you like to ski bumps, ski slowly and make a lot of turns, go a little shorter. The fatter the ski gets, the longer it should be. My hard snow skis are 177. My power skis are 189. You need a long ski in powder to keep moving. In deeper snow you need momentum. Short skis sink and you can’t move. If you are trying skis, always try the same ski in different lengths so you know for sure what is best for you. If you are going to buy new skis, always demo two lengths before you make your purchase. Don’t let some shop guy talk you into short skis. A: I have a quiver of skis as part of my “Ski with Kim” program. It’s a great opportunity to try skis without the additional cost and with some instruction on how to take advantage of the new shapes and designs. Even if you are not going to buy skis, you will gain the knowledge you need, so when you do want to buy you know what you like. Don’t get caught saying “I’m not good enough to tell the difference.” You are good enough and you can tell. Everyone is different and even the best pros don’t know what you will like. When you get on the right ski it’s like magic and you feel confident. When you are confident you progress more quickly and have more fun. 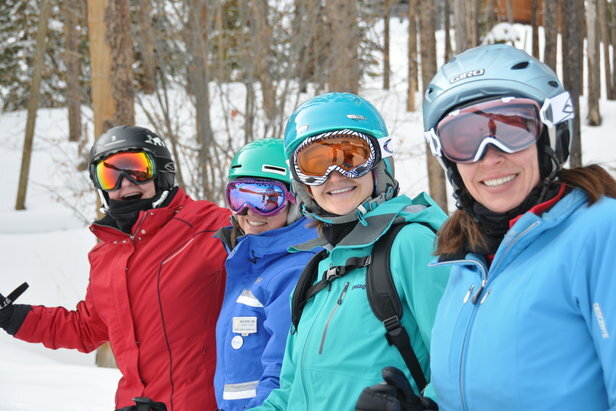 Q: What will you be doing this Saturday for K2 Women’s Ski Day? A: Saturday there will be a meet and greet at Christy Sports in the morning. Everyone who wants to is welcome to demo some K2 skis. I will be there to chat with people who have questions about the skis, need help deciding which to ski on and answer any questions people have. Then we will go skiing. I’ll ski with anyone who wants to make some runs. I’ll check back at Christy Sports every couple of hours to regroup and meet more people. In the afternoon there is an après ski party with refreshments and giveaways. Skiing Changed Significantly, Have You? You updated your ski technology, but how about technique?